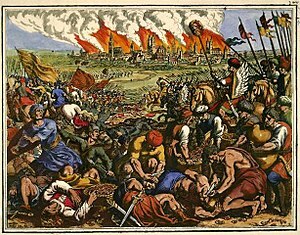 Battle of Legnica by Matthäus Merian the Elder, painted 1630. The Battle of Legnica (Polish language: Bitwa pod Legnicą ), also known as the Battle of Liegnitz (German language: Schlacht von Liegnitz) or Battle of Wahlstatt (German language: Schlacht bei Wahlstatt), was a battle between the Mongol Empire and the combined defending forces of European fighters that took place at Legnickie Pole (Wahlstatt) near the city of Legnica in the Silesia province of the Kingdom of Poland on 9 April 1241. A combined force of Poles, Czechs and Germans under the command of the Polish duke Henry II the Pious of Silesia, supported by feudal nobility and a few knights from military orders sent by the Pope, attempted to halt the Mongol invasion of Europe. The battle came two days before the Mongol victory over the Hungarians at the much larger Battle of Mohi. As with many historical battles, the exact details of force composition, tactics, and the actual course of the battle are lacking and sometimes contradictory. The general historical view is that it was a crushing defeat for the Eastern European forces where they suffered heavy casualties. It is known that the Mongols had no intentions at the time of extending the campaign westward, because they went to the Kingdom of Hungary to help the main Mongol army in the conquest of the country. One of the Mongol leaders, Kadan, was frequently confused with Ögedei's grandson Kaidu by medieval chroniclers, and thus Kaidu has often been mistakenly listed as leading the Mongol forces at Legnica. The Mongols considered the Cumans to have submitted to their authority, but the Cumans fled westward and sought asylum within the Kingdom of Hungary. After King Béla IV of Hungary rejected Batu Khan's ultimatum to surrender the Cumans, Subutai began planning the Mongol invasion of Europe. Batu and Subutai were to lead two armies to attack Hungary itself, while a third under Baidar, Orda Khan and Kadan would attack Poland as a diversion to occupy northern European forces which might come to Hungary's aid. Orda's forces devastated northern Poland and the southwestern border of Lithuania. Baidar and Kadan ravaged the southern part of Poland: first they sacked Sandomierz; then on 3 March they defeated a Polish army in the battle of Tursko; then on 18 March they defeated another Polish army at Chmielnik; on 24 March they seized and burned Kraków, and a few days later they tried unsuccessfully to capture the Silesian capital of Wrocław (Breslau). While deciding whether or not to besiege Wrocław, Baidar and Kadan received reports that King Wenceslaus I of Bohemia was two days away with an army of 50,000. The Mongols turned from Wrocław to intercept Henry's forces before the European armies could meet. The Mongols caught up with Henry near Legnica at Legnickie Pole (Polish for "Field of Legnica"), also known as Wahlstatt. The Mongol heavy cavalry in battle (13th or 14th century). The Mongol diversionary force, a detachment (no more than two tumens) from the army of Subutai, demonstrated the advantages of the tactical mobility and speed of horseback archers. The Mongol tactics were essentially a long series of feigned attacks and faked withdrawals from widely dispersed groups, which were designed to inflict a constant slow drain by ranged fire, disrupt the enemy formation and draw larger numbers away from the main body into ambush and flank attacks. These were standard Mongol tactics used in virtually all of their major battles; they were made possible by continual training and superb battlefield communication, which used a system of flags. The Mongol commander found the highest ground at the battle site, seized it and used it to communicate to his noyans and lesser commanders their orders for troop movement. The Mongol system was a stark contrast to the European systems, in which knights advanced with basically no communication with supporting forces. The numbers involved are difficult to judge. European accounts vary as to Mongol numbers—some suggest more than 100,000 at Legnica alone. These are gross overestimates, given that this number is far larger than the entire Mongol force in all of Europe, as well as not taking into account the weaknesses of 13th-century Mongol logistical support in Western Eurasia. Current estimates suggest the Mongol force numbered, at most, 20,000 light archer-cavalry. The Historia Tatarorum by the Franciscan C. de Bridia Monachi suggests a Mongol force of 10,000 troops, which would have been reduced to 8,000 after casualties suffered earlier in the campaign. What Mongol sources[which?] remain state that the Polish invasion was a raid in force of two tumens (20,000 men), and part of Subutai's master plan to destroy the European armies one at a time rather than allowing them to mass in force. According to James Chambers, Henry's force numbered at most 25,000 troops. Lesser trained forces included an army from Opole under Duke Mieszko II the Fat; Moravians led by Boleslav, son of the Margrave of Moravia Děpolt III; conscripts from Greater Poland; and volunteer Bavarian miners from Goldberg (Złotoryja). Henry's better trained troops were his own gathered from Silesian Piast duchies, mercenaries and very small contingents of French Knights Templar and Hospitallers. Historian Marek Cetwiński estimates the allied force to have been 2,000 strong, while Gerard Labuda estimates 7,000-8,000 soldiers in the Christian army. A contingent of Teutonic Knights of indeterminate number is traditionally believed to have joined the allied army. However, recent analysis of the 15th-century Annals of Jan Długosz by Labuda suggests that the German crusaders may have been added to the text after chronicler Długosz had completed the work. A legend that the Prussian Landmeister of the Teutonic Knights, Poppo von Osterna, was killed during the battle is false, as he died at Legnica years later while visiting his wife's nunnery. Henry II of Silesia was killed in the Battle of Legnica. Henry divided his forces into four sections: the Bavarian miners led by Boleslav of Moravia; the conscripts from Greater Poland along with some Cracovians led by Sulisław; the brother of the killed palatine of Kraków; the army of Opole under Mieszko, possibly with some Teutonic Knights; and, under Henry's personal command, the Silesians, Moravians, Templars and Hospitallers. According to Chambers' description of the battle, the Silesian cavalry initiated combat with the vanguard (mangudai) of the Mongol army. After the Silesians were repelled, the cavalry of Greater Poland, led by Sulisław, and the cavalry of Opole then attacked the Mongols. The Mongol vanguard retreated, inducing the allied cavalry to pursue, thereby separating them from the Polish infantry. Although the mangudai fled, Mongol light cavalry flanked the Polish forces. A smokescreen was used to hide the Mongol movements and confuse the Europeans. While the Mongol light cavalry attacked from the flanks and the heavy cavalry attacked from the front, Mongol archers peppered the Polish forces with arrows. Erik Hildinger indicates that the levies of Boleslav led the attack, instead of the Silesians. He adds that after the Polish cavalry began their pursuit during the Mongols' feigned retreat, a rider shouted "Run! Run!" (in Polish) to the Polish forces, confusing Mieszko, who ordered his Opole contingent to retreat from the battle. This withdrawal led Henry to order his own reserves and cavalry into the fight. The Mongols had much success in the battle by feigning their retreat. After the European knights detached from the main body of allied forces in pursuit of the fleeing Mongols, the invaders were able to separate the knights from the European infantry and defeat them one by one. The Annals of Jan Długosz also describes the battle, although it was written in the 15th century, not when it actually occurred. The army of Henry II was almost destroyed—Henry and Boleslav of Moravia were killed and estimates of casualties range from 2,000 to 40,000, essentially the entire army. The Templar Grand Master Ponce d'Aubon reported to King Louis IX of France that the military order lost 500 of their number, among them nine brothers, three knights and two sergeants. Mongol casualties are unknown; a perfect execution of their standard tactics would have minimised losses, but the Mongols endured sufficient casualties to dissuade them from attacking the Bohemian army. The Mongols cut the right ear off of each fallen European in order to count the dead; supposedly they filled nine sackfuls, though this has as much validity as European accounts of the numbers of Mongols. Henry was struck down and beheaded while attempting to flee the battlefield with three bodyguards, and the Mongols paraded his head on a spear before the town of Legnica. A scene from an altar of St. Hedwig of Silesia: Mongol warriors display the head of Henry II of Silesia on a long lance in an attempt to weaken the morale of the defenders. Wenceslaus I of Bohemia fell back to gather reinforcements from Thuringia and Saxony, but was overtaken by the Mongol vanguard at Kłodzko. However, the Bohemian light cavalry was able to ambush a Mongol detachment. As Baidar and Kadan's orders had been to serve as a diversion, and they were facing a regrouping opponent, they turned away from Bohemia and Poland and headed southward to join Batu and Subutai, who had soundly defeated the Hungarians at the Battle of Mohi. After the battle the Mongols had great success in seizing the cities of Germany and Poland. However, when Batu heard in 1242 that Grand Khan Ögedei had died the previous year, the Mongol army retreated again eastward. As was traditional, the Mongol army returned to the capital to elect a new Great Khan. After Batu Khan returned from Mongolia, his relations with his cousins were so poor that not until the election of Möngke Khan as Khagan did he again consider turning westward to Europe. However, he died in 1255 before those plans could be put into motion. Under the rule of his brother Berke, the Golden Horde was preoccupied with the conflict with their cousins in the Ilkhanate, led by Hulagu Khan, whom Berke Khan despised for the Battle of Baghdad and the murder of Caliph Al-Musta'sim. The Mongols never again seriously looked westward for conquest, only raiding for loot, and even then they were not able to commit the bulk of their forces, which had to guard against other Mongols. Led by Burundai, the Mongols successfully raided Poland in 1259. They raided again under the leadership of Tulabuga and Nogai Khan, successfully in 1286 and unsuccessfully in 1287. Because these raids were not aimed at conquest, Poland and Hungary were not seriously threatened again after 1241, although the Russian lands to their east remained under the rule of the Golden Horde for the next two centuries. However, Subutai and Batu Khan were finalizing a plan for a winter invasion of Central Europe, potentially leading to the "Great Sea" (the Atlantic Ocean), when Ögedei died. ↑ 1.0 1.1 1.2 1.3 1.4 AllEmpire.com. "The Battle of Liegnitz (Legnica), 1241". Accessed 5 October 2006 and 26 March 2011. ↑ 2.0 2.1 2.2 2.3 Erik Hildinger. "Mongol Invasions: Battle of Liegnitz". TheHistoryNet.com, originally published Military History magazine, June 1997. Accessed 2 September 2008. ↑ Michael Kohn (2006). Dateline Mongolia: An American Journalist in Nomad's Land. RDR Books. p. 28. ISBN 1-57143-155-1. http://books.google.com/books?id=-UnWOmL1a48C&pg=PA28&dq=battle+of+mohi+chinese+gunpowder&hl=en&ei=7GQzTv7dFNPTgAe1mdzrDA&sa=X&oi=book_result&ct=result&resnum=10&ved=0CFAQ6AEwCQ#v=onepage&q&f=false. Retrieved 28 November 2011. "the Mongols were finally met on the battlefield of Wahlstatt...by Duke Henry II of Silesia and 30,000 Teutonic knights from Germany, France and Poland. After an initial attack the Mongols...feigned retreat...It was in this state of chaos that the Mongols launched a surprise counter attack, complete with explosives, fire and flames. The disorientated European soldiers were cut to pieces; and estimated 25,000 men were either killed or captured. The Hungarians attempted to flee back to Pest but were slaughtered to the man;"
Maroń, Jerzy (2001). Koczownicy i rycerze. Najazd Mongołów na Polskę w 1241 roku na tle sztuki wojennej Europy XII i XIII wieku. Wrocław: Oficyna Wydawnicza Arboretum. ISBN 978-83-932793-2-6. Korta, Wacław (1983). Najazd Mongołów na Polskę i jego legnicki epilog. Katowice: Śląski Instytut Naukowy. ISBN 83-00-00646-X.